APC rolled out new UPS software to provide energy reporting for IT equipment. PowerChute 9.0 works with the APC Smart-UPS device series and calculates the cost of Smart-UPS’ power usage in kWh, enabling the user to see, via the LCD screen of the Smart-UPS, how the energy use of the protected equipment is affecting data center costs. In other words, on the UPS, the admin can see energy being consumed, the cost of the energy and CO2 being produced by the server equipment. When PowerChute is used with the Smart-UPS, admins can also configure exact sequences of equipment shutdowns and restarts so the critical servers can be online longer, allowing for greater flexibility. IT managers can also power down non-critical equipment to conserve runtime. PowerChute Business Edition 9.0 currently ships with the Smart-UPS 5kVA and you can also download it. Eaton Corporation just launched a UPS solution designed for consolidating standalone UPS units. The BladeUPS Preassembled System combines UPSs to simplify management of the devices and power capacity planning, and can be ordered with two-to-six Eaton BladeUPS units installed. The preassembled system comes with UPS modules and batteries installed in 42U of space, and the necessary internal system wiring and communication cards. 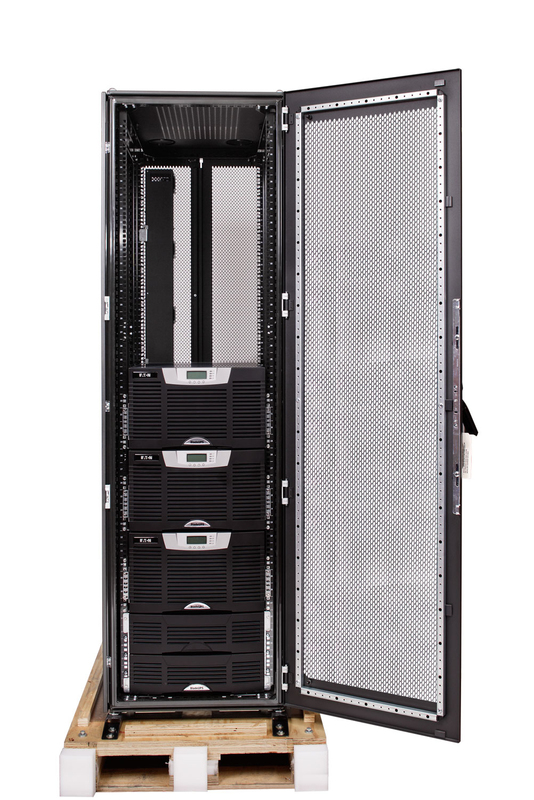 The BladeUPS modules within expand power protection from 12 kW to 60 kW in a 19-inch rack. In addition to energy and cooling cost savings it provides, Eaton says that since all UPS modules are preinstalled in the system enclosure, admins can save up to seven percent on installation costs compared to purchasing a bunch of separate components. The full announcement can be found here, and you can find out more about the product itself on Eaton’s website. Shown below is the BladeUPS Preassembled System.